This Valentine's Day card is a true classic, with red hearts decorating the top against a sweet pink background. 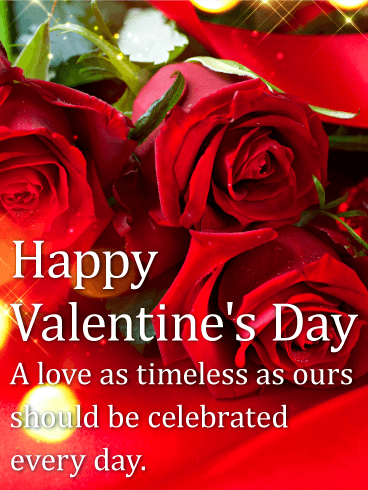 The beautiful message helps further convey your feelings for someone very special in your life. It's a reminder that the love you share is timeless, and how happy you are to be able to spend the most romantic day of the year with your forever Valentine. Happy Valentine's Day - My heart is so full of love for you, today and always. I can't wait to celebrate another year together. A single heart is cradled between two hands, with another pair of hands holding tight from underneath. It's a romantic reminder of how there's nothing more special than the love between two people. 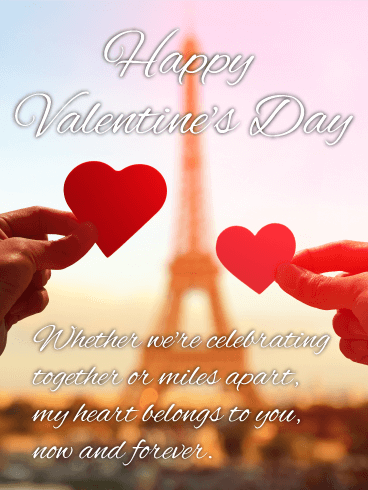 The image on this sweet greeting card is strengthened by the sentimental message below, which lets your Valentine know that even from the very beginning, you knew the two of you would be together forever. Here's a classic and charming Valentine's Day card to share with someone you love. 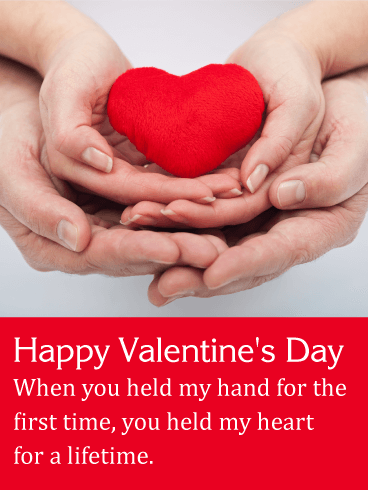 Romantic hearts give this greeting an extra sweet touch and the words are timeless: "Nothing makes my heart smile more than sharing this special day with the one I love." 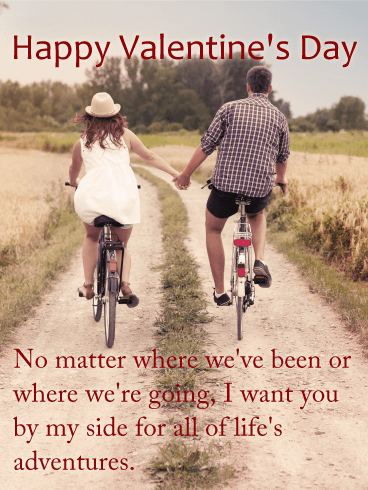 What a wonderful message to share with the one who has captured your heart forever. 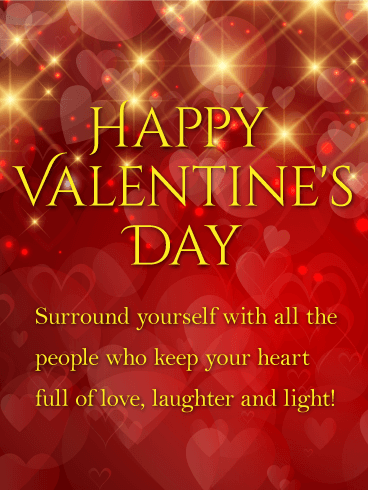 Valentine's Day is a celebration of romance, love, and caring, but it is also the perfect time to thank your partner for everything they do. Whether it's mowing the lawn, doing the laundry, cooking, cleaning, or caring for the kids, use this holiday to show your appreciation for the person you love. 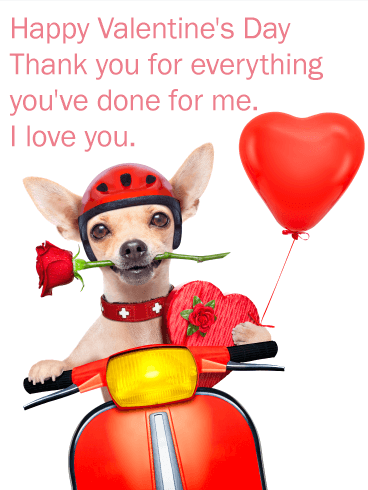 This Valentine's Day card is the perfect way to say thank you with a bit of fun, romantic humor! 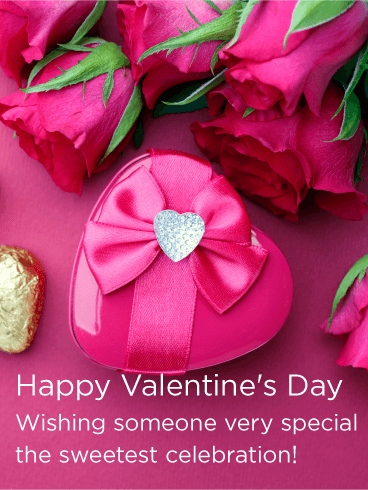 Pretty pink roses and a heart box full of luscious chocolates bring plenty of charm to this Valentine's Day greeting. The message is short, but very sweet: a simple wish for someone special in your life to have a wonderful celebration. This Valentine's Day card can be sent to anyone...from a best friend or close family member to even the littlest of Valentines! 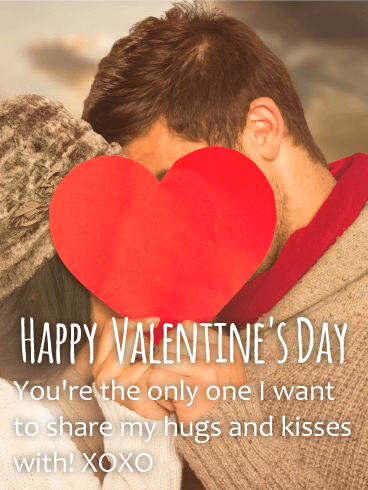 This flirty Valentine's Day message is short but very sweet!It lets that special someone know that they're the only one you want to share your hugs and kisses with. A classic red heart is held up in front of a couple in love, who steal a kiss or two behind it, creating an intimate moment between the two of them-a reminder of you and your own Valentine. This sweet and charming Valentine's Day card perfectly captures the spirit of the holiday. 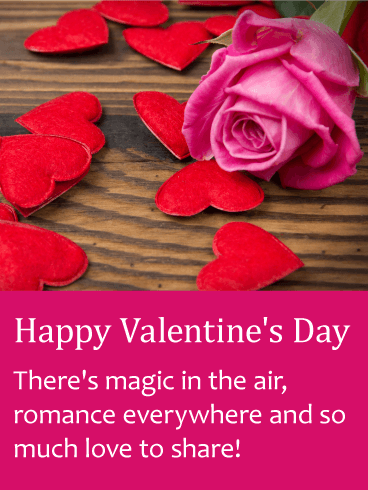 A scattering of hearts and a single pink rose are set against a rustic wooden background, with a lighthearted poem below. It's the perfect greeting for anyone... from the crush you're getting to know a little better to the one you've been with forever! A bike ride together is the ultimate symbol of the journeys you've already shared together-as well as the ones you've yet to take. 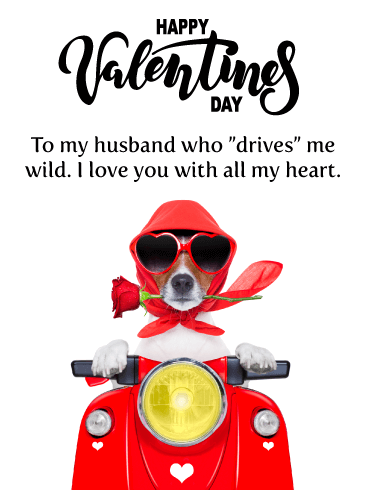 This romantic Valentine's Day greeting lets you say it from the heart to the one person who you want as your passenger through life. So whether it's a new relationship or a love that has spanned many years, it's the perfect Valentine's Day card to let you express exactly how you feel inside. Do you get hearts in your eyes when thinking about your significant other? Does your relationship make you see the world through love-tinted glasses? If so, this is the perfect Valentine's Day card for you! 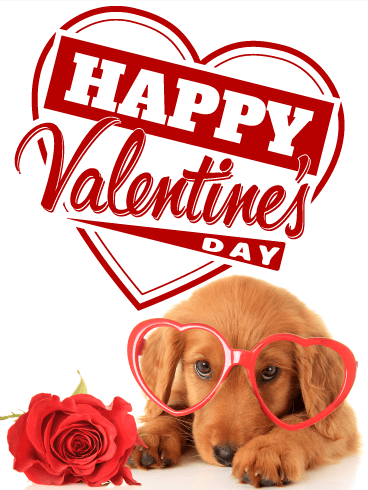 You may not be able to get your partner a real puppy, but you can send one with this adorable Valentine's Day card! Use it to add some cuteness to your sweetheart's workday today! 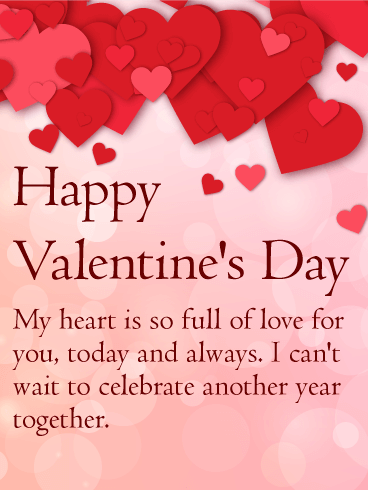 While February 14th may be set aside as a day to celebrate love, there's no reason you can't remind the one you love that the way you feel about them goes beyond a single date on the calendar. Classic red roses highlight this lovely Valentine's Day card, with twinkling lights helping to strike a romantic tone. The touching message adds to its beauty, which will have your Valentine feeling very special. This sentimental Valentine's Day greeting is as romantic as they come! Featuring the famous Eiffel Tower in the background, two charming paper hearts grow closer together, reminding the one you love that whether you're fortunate to be together this year or are separated by miles, the love you share is one that stands the test of time. 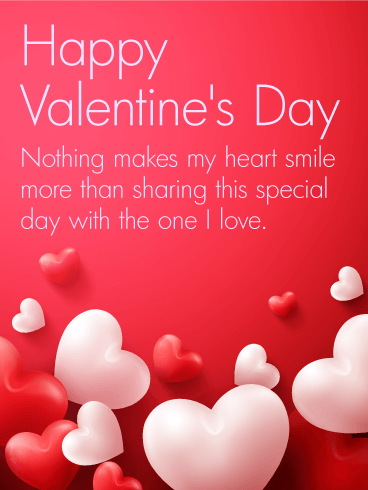 Send this Valentine's Day card to the one who holds your heart each & every day.